If you haven’t taken the time out to review and identify what parts of your IT infrastructure are housing the critical data, now is the time. You never know when you’re going to need it and verifying that you have a plan in place to get things back up and running should be a top priority for every business. Traditional storage systems required that you purchase “custom iron” with extra replication features that would allow your IT team to replicate VMs and databases between sites on a continuous basis throughout the day. With Software Defined Storage like QuantaStor, setting up remote replication policies (Disaster Recovery policies) has never been easier. The screen shot below (Figure 1) shows how easy it is to set up a remote replication policy with just a few clicks once your appliances are deployed. Remote Replication allows the copying of volumes and/or network shares from any QuantaStor storage appliance to any other appliance. It’s a great tool for migrating data between systems and is an ideal component of any Disaster Recovery (DR) strategy. Remote Replication is done asynchronously meaning that changes to volumes and network shares on one appliance is done up to every hour with calendar-based scheduling or as often as every 15 minutes with timer-based scheduling. Once a given set of the volumes and/or network shares have been replicated from one appliance to another, the subsequent replication operations send only meta-data changes between appliances. The replication logic is also efficient in that it only replicates actual data written to your volumes/shares and not unused regions of your disk storage which could be vast. To ensure proper security, all data sent over the network is encrypted. Because only the deltas/changes are sent over the network, replication also works well over limited bandwidth networks. Enabling storage pool compression (available with the default ZFS based Storage Pools) further reduces network load by keeping the data compressed as it is sent over the wire. 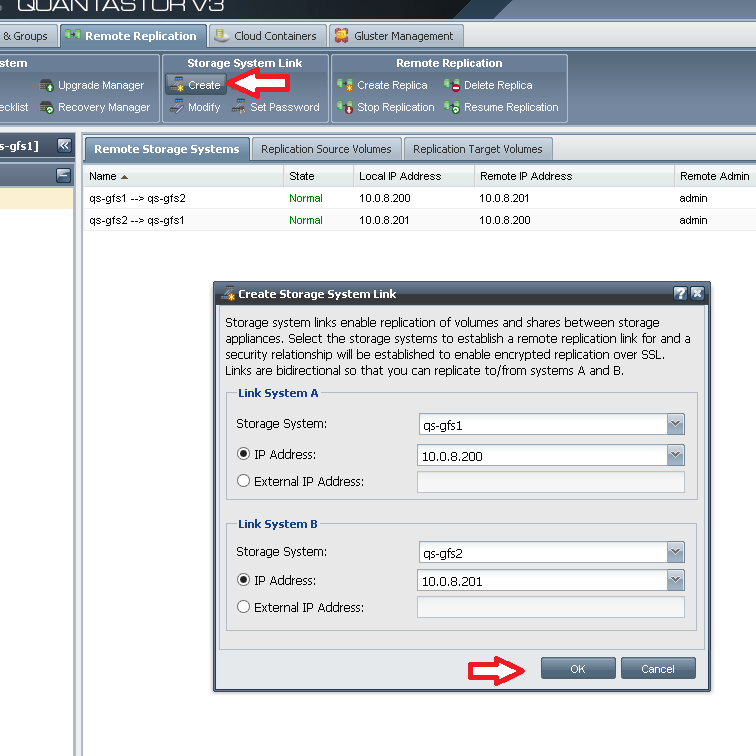 The first step in setting up Remote Replication is to form a grid of at least two QuantaStor storage appliances (link). Grids provide a mechanism for managing all your appliances as a single unit across geographies. The QuantaStor grid communication technology connects appliances (nodes) together so that they can share information, coordinate activities such as Remote Replication, and simplify management operations. After you create the grid you’ll need to setup a Storage System Link between the two or more nodes between which you want to replicate data (volumes and/or shares). The Storage System Link represents a security key exchange between the two nodes so that they can send data between each other using low-level replication mechanisms that work at the storage pool level. 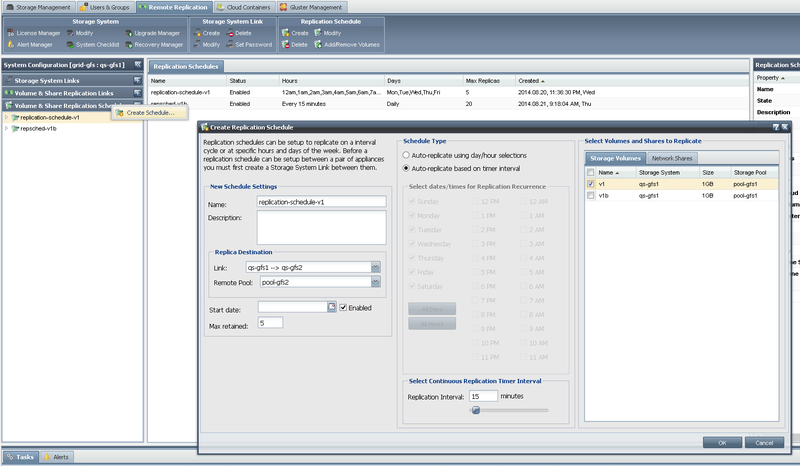 Select the IP address on each system for the Remote Replication network traffic. If both systems are on the same network then you can simply select one of the IP addresses from one of the local ports but if the remote system is in the cloud or remote location then most likely you will need to specify the external IP address for your QuantaStor system. Note that the two systems communicate over ports 22 and 5151 so you will need to open these ports in your firewall in order for the QuantaStor systems to communicate properly. Creating a remote replica is much like creating a local clone only the data is being copied over to a remote storage system storage pool. As such, when you create a Remote Replica you must specify which storage system you want to replicate too (only systems which have established and online storage system links will be displayed) and which storage pool within that system should be utilized to hold the Remote Replica. If you have already replicated the specified volume to the remote storage system then you can re-sync the remote volume by choosing the Remote Replica association in the web interface and choosing ‘resync’. This can also be done via the ‘Create Remote Replica’ dialog and then choose the option to replicate to an existing target if available. 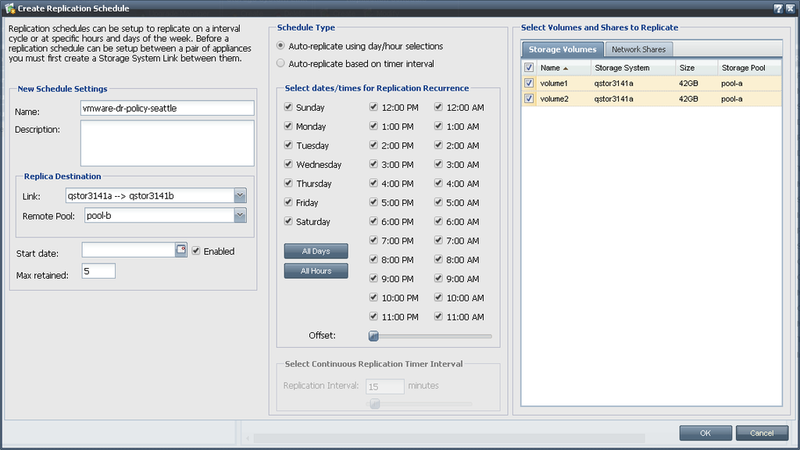 Remote replication schedules provide a mechanism for replicating the changes to your volumes to a matching checkpoint volume on a remote appliance automatically on a timer or a fixed schedule. This is also commonly referred to as a DR or Disaster Recovery replication policy, but you can use replication schedules for a whole host of use cases. Besides selection of the volumes and/or shares to be replicated, you must select the number of snapshot checkpoints to be maintained on the local and remote systems. You can use these snapshots for off-host backup and other data recovery purposes as well so there is no need to have a Snapshot Schedule which would be redundant with the snapshots that will be created by your replication schedule. If you choose five replicas then up to five snapshot checkpoints will be retained. If, for example, you were replicating nightly at 1 am each day of the week from Monday to Friday then you will have a week’s worth of snapshots as data recovery points. If you are replicating four times each day and need a week of snapshots then you would need 5×4 or a maximum replicas setting of 20. With the myriad of server hardware you can deploy QuantaStor SDS onto and the ease with which you can setup a DR / remote replication schedule, you now have the tools to get the business continuity plans (BCP) in place in a reliable and economical way. If you’re behind on your BCP, make micro goals to start chipping away at it and you’ll have the peace of mind you and your company need in no time.